Create, view, and manage users. Limit the IP addresses from which users can log in. Limit the times at which users can log in. When you ensure that only employees who meet certain criteria can log in to Salesforce, you're protecting your data at the broadest level. You do this by managing authorized users, setting password policies, and limiting when and where users can log in. Every Salesforce user is identified by a username, a password, and a single profile. Together with other settings, the profile determines what tasks users can perform, what data they see, and what they can do with the data. To view and manage the users in your org, use the Quick Find box in Setup to find Users. The user list shows all the users in your org. You can create users—even multiple users—in just a few clicks. It’s as simple as entering a username, alias, and email, and selecting a role, license, and profile. Many more options are available, of course, but that’s all you need to get started. Salesforce auto-generates a password and notifies new users immediately. Users can change or add to their own personal information after they log in. Use the Quick Find box to find Users | Users in Setup. Or you can click Add Multiple Users to add up to ten users at a time. Enter the user’s name, email address, and a unique username in the form of an email address. By default, the username is the same as the email address. Select the user license this user will have. The license determines which profiles are available for each user. Select a profile, which specifies the user’s minimum permissions and access settings. 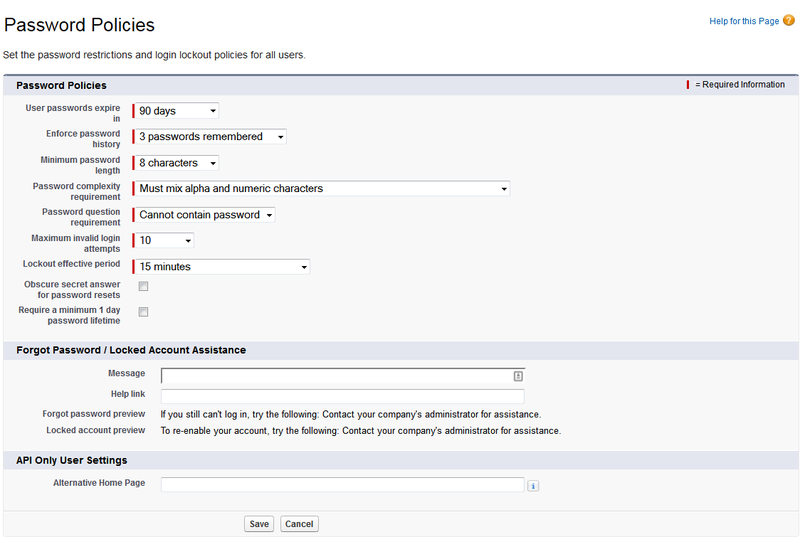 Select the option to generate a new password and notify the user, then save. You can't delete a user, but you can deactivate an account so a user can’t log in. Deactivated users lose access to all records. (That includes records that are shared with them individually and records shared with them as team members.) However, you can still transfer this data to other users and view the names on the Users page. In Setup, use the Quick Find box to go to Users. Click Edit next to the name of the user you want to deactivate. Clear the Active checkbox and click Save. If you can’t immediately deactivate an account (for example, when the user is selected in a custom hierarchy field), you can freeze their account. That prevents the user from logging in to your organization while you’re working on deactivating them. On the Users page in Setup, click the username of the user whose account you want to freeze. You can configure several settings to ensure that your users’ passwords are strong and secure. Set password and login policies, such as specifying an amount of time before all users’ passwords expire and the level of complexity required for passwords. Expire the passwords for all the users in your org, except for users with “Password Never Expires” permission. Reset the password for specified users. If a user is locked out due to too many failed login attempts, you can unlock the person’s access. Use the Quick Find box to find Password Policies in Setup. How long should passwords be? Longer is usually better, within reason. How complex do you want your passwords? You can require alphabetical, numeric, uppercase, lowercase, or special characters. How many days is a password valid? How many times can someone try to log in with invalid credentials before being locked out? Choose what to do about forgotten passwords and locked accounts. The first time you log in to Salesforce, the IP address is cached in your browser. Anytime you log in from a different IP address, you will be asked to verify your identity, typically by entering a verification code. You can bypass this step for trusted IP ranges. For example, suppose that your users should be able to log in without entering a verification code whenever they are in the office. From Setup, in the Quick Find box, enter Network Access, then select Network Access. Enter the start and end point of the range of trusted IP addresses, and click Save. If you have an address outside this range, you aren't excluded from logging in. You simply have to verify your identity by entering a verification code. By default, Salesforce doesn't restrict locations for login access. If you do nothing, users can log in from any IP address. You can restrict where users can log in from using profiles. For example, suppose that certain users shouldn’t be able to log in if they’re using an IP address outside of the office. From Setup, in the Quick Find box, enter Profiles, then select Profiles. Select a profile and click its name. Click IP Ranges. 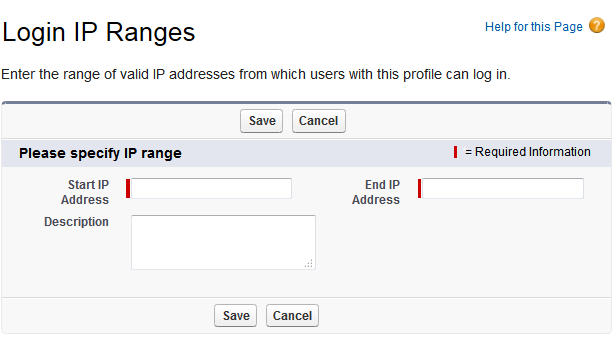 If you don't have Enhanced Profile Interface enabled, scroll down to the Login IP Range related list. Now all users with this profile who are outside the trusted range can't log in. When using profile IP ranges, there are no verification codes to worry about - a user is either in or out. For each profile, you can specify the hours when users can log in. For example, if you decide your call center employees really only need to look at customer data while they're taking phone calls nine to five, you can make it so they can't log in during evenings and weekends. Click the profile you want to change. Under Login Hours, click Edit. Set the days and hours when users with this profile can log in to the organization. To allow users to log in at any time, click Clear all times. To prohibit users from using the system on a specific day, set the start and end times to the same value. If users are logged in when their login hours end, they can continue to view their current page, but they can’t take any further action.